Hello ... Hello ... my old friends ... It's great to see you once again! It's always nice to be contacted by a new friendly musical face asking me to have a listen to their original material and/or put it on the play list for the "KJS Suggests" show over on Hamilton Radio. 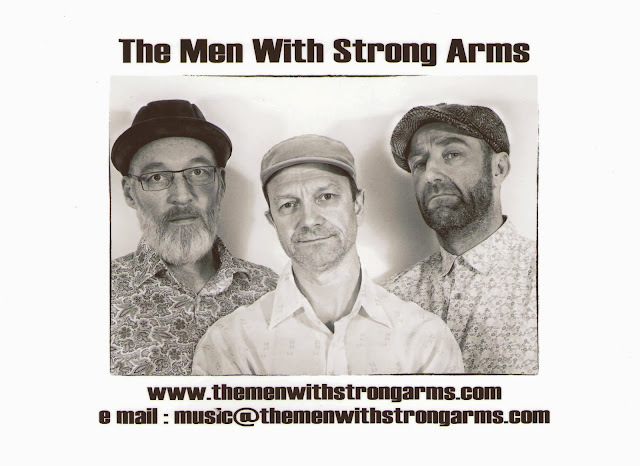 And so it was when songwriter and lead vocalist Jon London with the interestingly named The Men With Strong Arms - a Folk, Blues & Americana influenced trio based in Hove, England - dropped me a line and then sent me their new six track mini-album entitled "Sunshine Street". KJS: What might be your favourite ELO or Beatles songs and why? Jon: I grew up listening to the Beatles, the first single I ever got was: "Hello Goodbye". They have always been a huge influence simply because they, Lennon and McCartney, have produced some of the finest lyrics ever penned and lyrics are what engages me most in music. My favourite Beatles song is: "Penny Lane", I love the narrative. It's the line: "Of every head he's had the pleasure to know" that gets me, it's a lovely concept and play on words, and it's a great example of how to make a simple beautiful song. It is also a song about observation which, is a fundamental part of all good song writing, so in a way it's a song about how to write a good song, well to me it is. KJS: What's the story line behind each song on the album? Jon: "The Men With Strong Arms" is about the working class men who built Great Britain during the Industrial Revolution. "Precious Times" is about those special moments we have when we are young that seem so distant once adult life kicks in. "Sunshine Street" is based partly on where I grew up, a small village in Hampshire, and those typical rose tinted concepts we have about an idyllic country life. "Bread And Wine" is about sexual appetite. "Sleep" is about lost love and lost sleep, two things I have found go hand in hand. "Late Walk Home" is again inspired by growing up in the country and making my way back home after dark, when every unknown sound makes you nervous." ELO Beatles Forever [ELOBF] recommends "Sunshine Street" by The Men With Strong Arms to those enlightened folks who enjoy the music of ELO, Jeff Lynne, The Move, Roy Wood, The Idle Race, 'Brum Beat', The Beatles and related artistes.